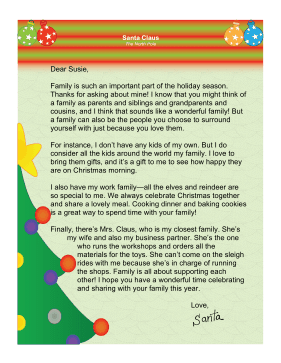 Children who ask about Santa family members can get answers with this letter from St. Nick. Family is such an important part of the holiday season. Thanks for asking about mine! I know that you might think of a family as parents and siblings and grandparents and cousins, and I think that sounds like a wonderful family! But a family can also be the people you choose to surround yourself with just because you love them. For instance, I don't have any kids of my own. But I do consider all the kids around the world my family. I love to bring them gifts, and it's a gift to me to see how happy they are on Christmas morning. I also have my work family—all the elves and reindeer are so special to me. We always celebrate Christmas together and share a lovely meal. Cooking dinner and baking cookies is a great way to spend time with your family! Finally, there's Mrs. Claus, who is my closest family. She's my wife and also my business partner. She's the one who runs the workshops and orders all the materials for the toys. She can't come on the sleigh rides with me because she's in charge of running the shops. Family is all about supporting each other! I hope you have a wonderful time celebrating and sharing with your family this year.